Middarmark, Torchbearer GM Screen Now on Sale! I know many of you that missed the Kickstarter have been eagerly awaiting the release of Middarmark. Well the time has come. The Middarmark book+PDF ($20) and PDF ($10) are now available on the Burning Store, as is the new and improved Torchbearer GM Screen ($15). 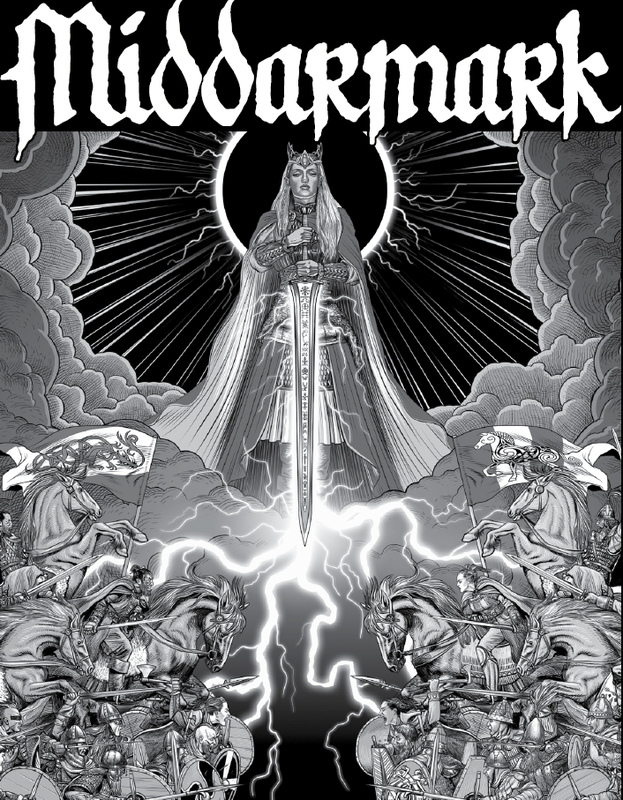 For those of you who may have missed it, Middarmark is a setting supplement for Torchbearer inspired by Scandinavian myth and folktales. It’s chock full of adventure ideas to give you a jumping off point for your campaigns, along with new settlements, legends of infamous lairs and harrowing places, details on the more popular Hero Cults of the Young Lords, and, of course, new spells, magic items, monsters and more! Contend with the slave-taking pirates of the Skera Strait and the Kraken that preys upon those waters. Explore the Trollfjells for signs of the chaos cultists of the Jotunn Hrym and the terrifying Temple of Black Skulls dedicated to him. Follow the legends of Sigrun, Lady of Battles, to the fog-shrouded barrow downs in hope of winning her war-magic. Aid the elves who quest ceaselessly for the Tower of Seven Dreams where the Erlking holds the key to ending their long exile. Seek the fate of the fabled dwarven kingdom Nidavellir, near the gates of Hel. Adventure awaits! Middarmark opens new vistas of possibility for Torchbearer. Within you’ll find nature descriptors and questions for six human tribes, a new class in the form of the human skald, rules for steadings (a new form of town), rules for how various weather conditions affect your adventurers and much more. This entry was posted in BWHQ News, Middarmark by Thor Olavsrud. Bookmark the permalink.